It’s a bang-up breeding year for super-endangered birds! First, wildlife officials in Louisiana announced the first successful wild Whooping Crane nest in that state since 1939. 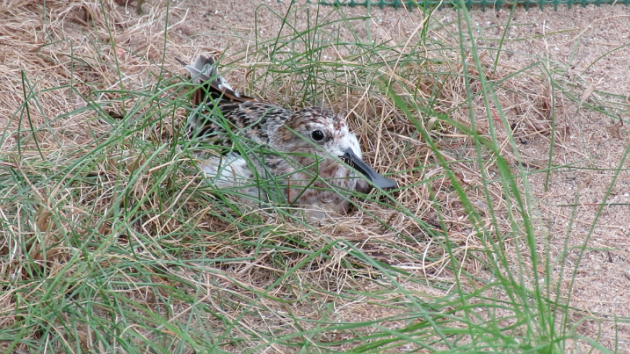 Now, it’s Spoon-billed Sandpipers’ turn. The species, which migrates from the Russian Arctic to Southeast Asia, is down to about 200 breeding pairs in the wild, due to habitat loss and poaching. As a backup plan, researchers captured some Spoonies in Siberia in 2011 and brought them to England, where they’ve been raised at the Wildfowl and Wetlands Trust (WWT) in Slimbridge, Gloucestershire. For the past several years, getting the birds to breed has been an exercise in futility. According to WWT conservation chief Nigel Jarrett, “We’ve been doing everything short of playing Barry White.” These efforts involved complicated regimes of special lights, timers, sand, and netting, to reproduce (pun half-intended) the variety of environments and phenomena that the Sandpipers would naturally encounter while migrating and breeding. Happily, all of the hard work looks to have paid off. Two different females among the captive group have laid eggs, and scientists are keeping a watchful eye on a few others. 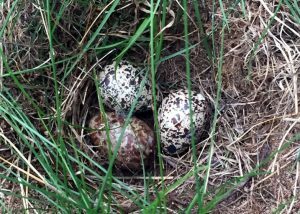 While it’s still a bit early to say how many of the eggs will develop into healthy chicks, this is wonderful news for the Spoonies and their fans worldwide. Bonus birding content: On June 9th, Google celebrated the birthday of birding legend Phoebe Snetsinger with a heart-rending Doodle! Excellent news – however, I think they should have played Barry White right away.